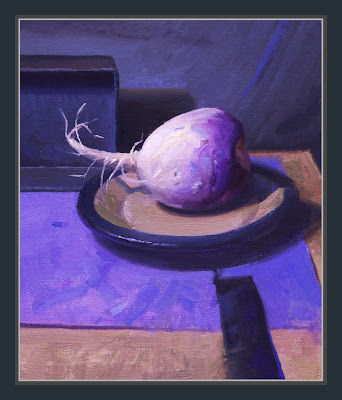 Turnip - This piece was difficult to find but once established the subtle harmony was worth the search. Beautiful purple, glad to see these paintings, they are so inspiring, is like to say that they are a lot of things to do in painting, not every thing is done, as many people think. Cheers Dan . As usual, beautiful. Just beautiful. Love your still life pieces, Dan. Esp. the palettes you use for each of them. Great purples, the limited colours work so well with the simple composition and really give the painting a 'mood'. Intelligent and fantastic. It's great to see.